Theatre In The Pound is a not-for-profit night, designed for individuals or groups of theatre practitioners to showcase new work in the main house of The Cockpit. Pieces can be any length of time, up to fifteen minutes. Each piece is followed a by a short feedback discussion with the audience, to help companies develop the work. With the entry fee at £1, Theatre In The Pound is a great low-cost evening out. As well as welcoming theatre enthusiasts and practitioners through the doors, Theatre In The Pound is accessible to those who would not normally go to the theatre. It’s the perfect evening to try something new. Theatre in the Pound is designed for the theatrical; plays, dance, opera, performance art, musical theatre, puppetry, performance poetry, physical theatre, and plenty more disciplines are welcome (although we're not so interested in stand-up, bands or jugglers). To hire the space, each company pays £15 (plus £1 per head on the night) and, in return, we provide a platform for new performance. That's £1 for every minute of performance time. Last season we were heavily over-subscribed, so make sure you apply early to get a slot! Theatre in the Pound is about enabling work - or even the seed of an idea - to be seen, when the cost of hiring an entire venue is as such that regular showcasing or experimenting in a professional context is financially difficult for most people. We will sort through applications to put together a balanced programme that will work for the audience; heavy and light, fast and slow, musical, fiction etc. so please use the application form to indicate as clearly as possible the kind of performance you want to bring to Theatre In The Pound. We're particularly interested in the work of dedicated new directors and new kinds of theatrical writing and devising but we'll only turn something down if it's illegal, breaches our licence, is totally inappropriate for the space or if we've run out of slots. 1) It must be no longer than 15 minutes. 2) It must be legal (IE No copyright infringements, incitement to hatred, or anything else that threatens our licence). 3) It must be theatrically interesting (IE No stand-up, bands or jugglers (except for our Circus Specials, when Jugglers are, of course, welcome). There is a growing community of keen Pound followers, so if you need some help to fill the gaps in your project, let us know and we’ll put the word out to help you find new collaborators. We welcome repeat applications, however new applicants will be given priority. Applicants are free to undertake their own advertising once we've received a signed contract, your fee and deposit. Information, logos, maps, etc are available via email, together with an e-flyer. We will promote Theatre In The Pound any way we can including listings in Time Out, etc and our mailing lists – and through our social networking sites, however we cannot provide marketing for individual performances. The main theatre is a black box comprising a thrust playing space, approximately six metres across by eight metres deep with raked seats on three sides. Each side contains sixty seats, with black tabs or a white cyclorama to the rear. There are two large dressing rooms backstage but limited wing-space. Theatre In The Pound sometimes takes place during a run of another show, which might mean we have to work around another set and lighting design. We'll do our best to make things as neutral as possible. We can provide a good general cover, a centre spot and (providing we know about it one week in advance) one special. 2 SM58 mics on stands. CD player. NB: If you need more than simple intro/outro music, sound should be provided on CD. Using several CDs can be problematic. MP3s cannot be cued neatly off an iPod, so please consider another playback method. Your show will almost certainly be more successful if you keep it technically simple with the minimum of lighting and sound cues. If you have a set, it should be easily assembled and not consist of anything that you can't manage to carry between two people. Make sure you have someone available to carry it. We can provide useful bits of furniture. Check with us first, but we have chairs, tables, etc, which are generally suitable for most pieces. After we've looked over your application and confirmed your slot with you, we'll send you two copies of a contract signed by the Theatre In The Pound administrator, which will specify a date/time slot and will commit us all to staging the event. The contract also spells out who's responsible for what. If it doesn't suit you, please ring us to discuss it. Once we're all happy, you sign both copies of the contract and return one to us. 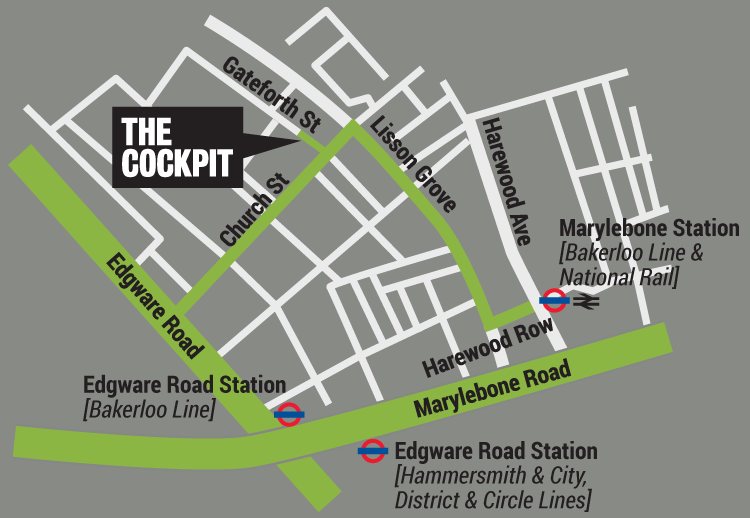 Then contact The Cockpit reception on 020 7258 2925 to pay your £15 by credit/debit card. Note that there is a £50 cancellation penalty clause in the contract if you cancel with less than 14 days notice.